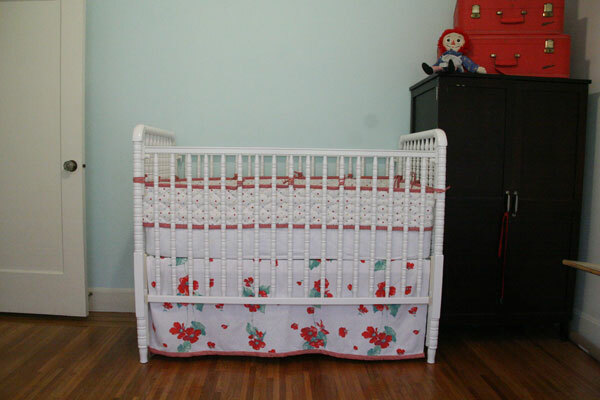 Finally, here is the crib skirt I made for the Peach’s nursery out of a vintage table cloth. It’s the same fabric style as the quilt I made before the baby was born for the nursery. I like the look of it with the gingham edging–sweetly old fashion, but not too cloyingly girl nursery, I think. I bought the crib bumpers from IKEA about nine months ago or so. However, I did have to take off all of the ties and add extras to have it properly fit my Jenny Lind crib. And you can see touches of other items in the nursery. One of the drawbacks of this room is the complete lack of closet space. The original closet was turned into a stairwell to the knotty pine converted attic/craftroom/office. Ever the Clever Clogs, I turned an old “office in a box” piece into a wardrobe and added more storage with a set of red vintage luggage. And an old Raggedy of mine watches the Peach sleep. More nursery updates throughout the month as I try to finish it before I head back to work. It’s beautiful! 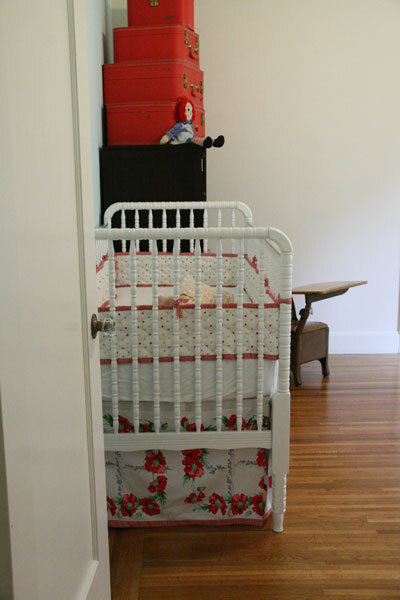 I love the Jenny Lind crib and all the vintage-y goodness! Crib! Where did you get that crib! I’m looking all over to no avail! Next Next post: I heart bargello!